Microsoft is trying to shed the negative image that Internet Explorer has garnered over the years with the latest version of its browser, Internet Explorer 11. IE11 Release Preview for Windows 7 is available for download today, and with it comes a number of under-the-hood improvements, especially in the speed department. It's at least 30% faster than other browsers, according to Internet Explorer Group Managers Sandeep Singhal and Rob Mauceri in an official blog post today. That's 9% faster than IE10 and a 5% improvement over the IE11 Developer Preview Microsoft released in July. Of course, these are Microsoft's figures, so some independent testing is needed to verify the company's claims. 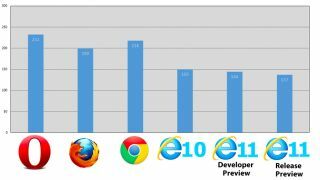 In addition to claiming 30% faster than its nearest competitive browser, Internet Explorer 11 supports more web standards than before and uses new F12 developer tools. "Now that the Pointer Events specification is a Candidate Recommendation at the W3C, IE11 supports an un-prefixed version of the emerging standard," wrote Singhal and Mauceri. "With Pointer Events support across the full range of Windows devices (and soon to other browsers), Web sites can easily build experiences that work equally well with mouse, keyboard, pen and touch." Other standards implemented include the Standard Delivery Profile for Closed Captioning and the latest Tracking Preference Expression (DNT) draft compliant with W3C. "For developers, IE11 supports the latest Web standards and technologies, making it easier to build sites that work across devices," the managers explained. "The new F12 tools in IE11 enable developers to build high performance Web experiences, faster and more efficiently." These perks for developers should be passed onto the web-surfing consumers who give Internet Explorer another chance. Microsoft began a "Rethink Your Relationship With Internet Explorer" advertising campaign today, touting a website that isn't shy about its past mistakes, BrowserYouLovedToHate.com. The new beginning for its famous and sometime infamous browser doesn't have a firm release date yet for Windows 7, but Windows 8 users updating to Windows 8.1 should see the browser on Oct. 17.